If chocolate loves mint, why can’t it love basil? If you’re still not convinced, this Chocolate Basil Cake will prove to be the life of the party. Brilliantly moist, light & airy with gorgeous chocolate flavor, the cake suggests something familiar, but so subtle that it’ll keep everyone intrigued. Soon the room will be buzzing, mostly about what’s in the cake, but perhaps a little about how crazy the baker is. Either way, you’ll be tooted as the best host ever. Daisy’s birthday is coming up and she’s asked for chocolate cake. She’s definitely mine. In the past, my homemade chocolate cakes were neither moist nor chocolaty. Boxed cake mix always turns out perfect, but I really want to make her cake from scratch. So I took a couple of my old favorite recipes. Buttermilk and melted chocolate add depth and moisture. I woke up early this morning to do a test run. The smell of warm chocolate fudge coming from the oven and the fragrant basil soon had Daisy out of bed and dashing to the kitchen to see what’s up. Off she went, cupcake in hand. When I found her, the wrapper was wiped clean and chocolate was all over her smiling face. Place a piece of parchment paper onto a clean, flat surface. Sprinkle sugar onto the paper. the basil into the sugar. Once incorporated, spread the basil sugar evenly over the paper. Let it dry overnight, at least 4 hours. Pulse mixture in a small food processor to break up the chunks. Line 2 cupcake pans with paper cups. Melt chocolate and butter in microwave in 30-second bursts. Take out, stir and check. Do not overheat the chocolate as it will seize (become crystalline). Set aside to cool a bit. Cream butter and basil sugar. Drizzle melted chocolate slowly, mix til smooth. Sift flour, cocoa, baking powder and salt over the mixing bowl. Mix just until dry ingredients disappear into batter. Add buttermilk and mix til smooth. Fill each cupcake well 2/3-full with batter and transfer to hot oven. Bake for 20-25 mins, until you can smell the chocolate or until wooden toothpick inserted in center comes out clean. Remove from oven and allow the cupcakes to rest in the cake pans for 10 mins. Turn onto metal racks to finish cooling. Whipping heavy cream until soft peaks form. Drop dollops on top of each cupcake. Finish with a sprinkle of basil sugar. 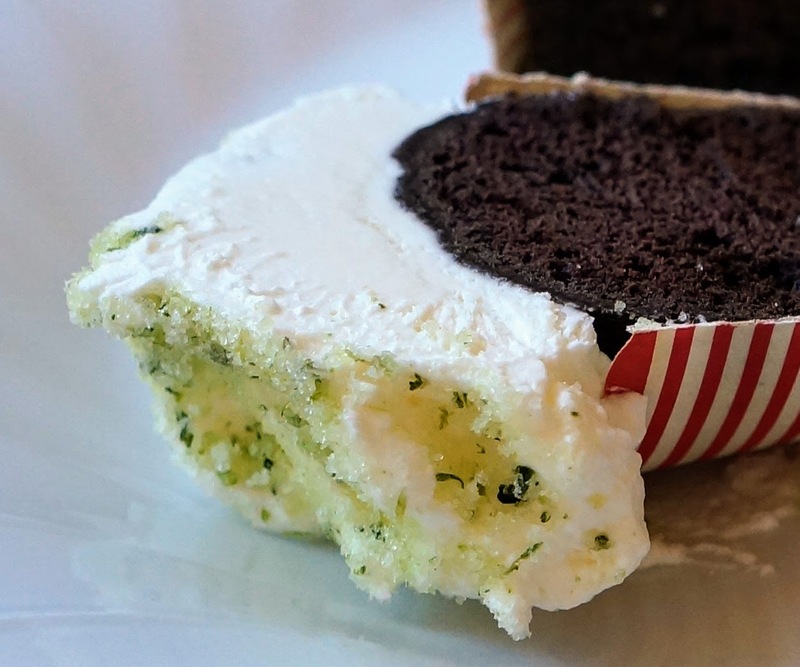 This Chocolate Basil Cake recipe is now my absolute favorite. I’ll never buy cake mix again. The basil adds a just a touch of something unexpected. The cake is light, moist, chocolaty, everything my little sweetheart wished for in a birthday cake. I do hope you give this a try today. Come back and tell me what you think. Don’t forget to grab your $1 coupon here before you go shopping. Oh my gosh, this my friend, is BRILLIANT. & delicious, I’m sure!